Never Say Diet: Make Five Decisions and Break the Fat Habit for Good is written by Chantel Hobbs a personal trainer, spinning instructor and motivational speaker, who once weighed almost 350 pounds. When Hobbs realized her weight was a serious risk to her health she made the decision to do something about it, starting by simply exercising for thirty minutes each day. Over time she increased her workouts, learned about nutrition and adjusted her diet so that eventually she lost over 200 pounds, as well as becoming a marathon runner. Hobbs asserts that dieting is not an effective way to lose weight and she encourages readers instead to adopt a healthy lifestyle. In her book she provides dieters with a 16-week program that emphasizes a balance between healthy eating, regular exercise and behavioral changes so that it becomes easy to lose weight without the need to follow a strict diet. She says that first it is important to understand your relationship with food and your eating habits and then to make adjustments in your routines. Dieters are told to stop making excuses and change their way of thinking to adopt a more positive outlook. For the first four weeks of the program dieters are recommended to make no major changes in eating habits, apart from making sure to eat breakfast each day. Later she advises consuming five small meals a day and emphasizes the importance of making healthy food choices. Never Say Diet suggests that we make food boring in the beginning so that we break the habit of eating for pleasure rather than nutrition. Hobbs recommends making a week’s worth of meals and to keep eating the same meals for four weeks. This will give you time and energy to focus on other things, like exercise, that will enhance your ability to lose weight. Dieters are advised to avoid the tendency to skip meals as this usually leads to overeating later in the day. One free meal a week is encouraged as part of a long-term approach to weight management because this makes it easier to stay on track with a healthy eating plan. Never Say Diet does not include a specific diet but basic nutritional information is provided along with a selection of ideas for healthy meals and shopping lists. For each week of the program inspirational scripture and quotes are given, which have the intention of increasing motivation. Hobbs also provides emotional support and encouragement and her own personal story of transformation will be inspirational for many readers. Fruit, vegetables, whole grain bread, high fiber cereal, brown rice, skim milk, low-fat yogurt, fat-free sour cream, egg beaters, turkey, chicken breast, tuna, lean beef, protein shakes, almonds, cashews, peanut butter, light mayo, light salad dressing, salsa, all fruit jam, green tea. Never Say Diet includes five phases, each of which includes a specific exercise routine involving a combination of cardio and resistance training using dumbbells and a stability ball. The exercises are illustrated with pictures making it easy for beginners to understand how to do them correctly. 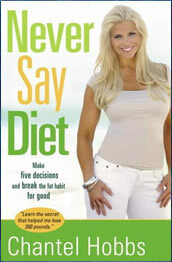 Never Say Diet: Make Five Decisions and Break the Fat Habit for Good retails at $13.99. Also available is The Never Say Diet Personal Fitness Trainer: Sixteen Weeks to Achieve Your Goal of a Healthy Lifestyle, which retails at $10.99 and includes space for journaling your exercise, food intake and emotional experiences. Encourages a long-term healthy lifestyle approach to weight management. Many readers will relate to the author’s personal story. Includes basic nutrition information and meal suggestions. Will probably not appeal to non-Christian readers. Results will generally take some time to become apparent. Author is critical of all diets yet is promoting a diet plan. Never Say Diet is based on the premise that losing weight and keeping it off over the long term is related to a combination of healthy eating, exercise and self-empowerment. This program has a strong emphasis on faith, which will appeal to Christian readers, while encouraging a healthy lifestyle approach to weight management.